Early explosiveness led Whitehall to a 29-14 victory over Cambridge and a second straight regular season Section II Class D title Saturday. The first two series were the deciding factors in Cambridge’s first home loss since 2008. The Railroaders opened the game with the ball on their own 35-yard line and pieced together a time-consuming scoring drive. With running back Daryl Hillman grounding and pounding, a vital completion from quarterback Derek Thomas to tight end David Camara kept the drive alive. Hillman got the rock a few more times on the drive, as Whitehall pounded into the Cambridge red zone and then the end zone with relative ease. Hillman capped the drive with an 8-yard touchdown run. Whitehall then faked the kick and threw for the 2-point conversion to lead 8-0 with 6:50 left in the first quarter. Hillman’s running was a little more physical than his usual elusive running. The subsequent drive for Cambridge went haywire. On the first snap, Whitehall nose tackle Jake Gregory blew up the middle of the Cambridge line, recovered a fumble and trotted 36 yards to paydirt. Nick Kennedy tacked on the extra point and just like that Whitehall led 15-0. The Indians’ next drive didn’t go much better. Starting from the 50-yard line, the Indians began to piece together a drive, until Whitehall cornerback Jason Hart put his helmet on the football and forced another fumble. “We could get a drive going and then they’d make some sack or a play behind the line of scrimmage,” Luke said of the Railroaders’ defense. Whitehall held Cambridge scoreless through the first quarter but the home team got on the board with 9:21 left in the second quarter. Running back Andy Romack scored a 17-yard touchdown on a drive that Cambridge started at midfield. The Indians added a 2-point conversion to tighten the score at 15-8. But just as the Indians appeared to have momentum and a huge crowd on their side, Whitehall took the wind out of the sails. Hillman fielded the subsequent kickoff at the Whitehall 25, found a seam up the middle and raced for a 75-yard touchdown return. Cambridge turned the ball over on downs on the following drive and Whitehall responded with a touchdown drive of just under 6 minutes as the half wound down. A few big runs from Hillman and some Cambridge penalties kept the Railroaders’ drive alive, eventually leading to a 4-yard touchdown run by Thomas. Thomas then found his twin, Tyler, for the 2-point conversion and with 28 seconds left in the half Whitehall led 29-8. The Indians ran out the clock to end the first half and came out with some more energy in the second half, but were only able to get one score back. With 3:07 left in the third, Romack scored his second touchdown on a drive that started at the Cambridge 25-yard line. Cambridge failed to convert the extra point and trailed 29-14. 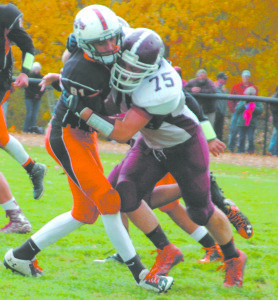 Whitehall, with about three minutes left in the game, appeared to cap the victory with another Hillman touchdown, but it was nullified by a holding penalty. Whitehall then ran the clock down to 16.5 seconds. With a 7-0 regular season behind them, the Railroaders look ahead to the post season, starting with the Sectional playoffs. As of press time, Whitehall no longer had a crossover game on its schedule. Rumors initially surfaced that Whitehall had come to an agreement with Granville to play a crossover game, Granville athletic director Eileen Troy did not return calls for comment on that matter. Then Whitehall was scheduled to play at AuSable Valley, until schedule-makers realized the two already played this season. Whitehall won that game 41-0. Eventually it was decided that Whitehall would play Class B Albany Academy, but Albany Academy officials informed Whitehall officials Monday that they had to fold their program due to a lack of numbers. So, currently, Whitehall has nobody to play against for a crossover and will instead look ahead to the Section II Class D playoffs, which kickoff the last weekend of this month. 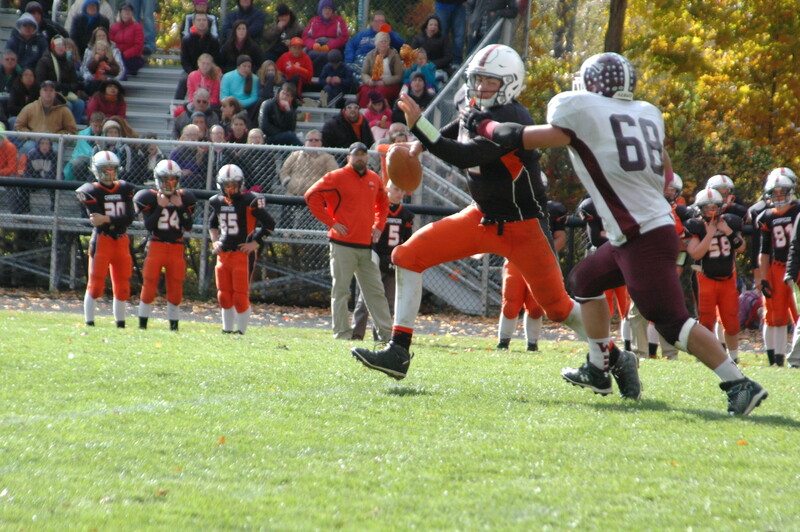 The top-seeded Railroaders (7-0, 5-0) will battle the fourth-seeded Warrensburg Burghers (3-4, 2-3) in the first round of the sectional playoffs on Saturday, Oct. 31, at 2 p.m. at Schuylerville High School. 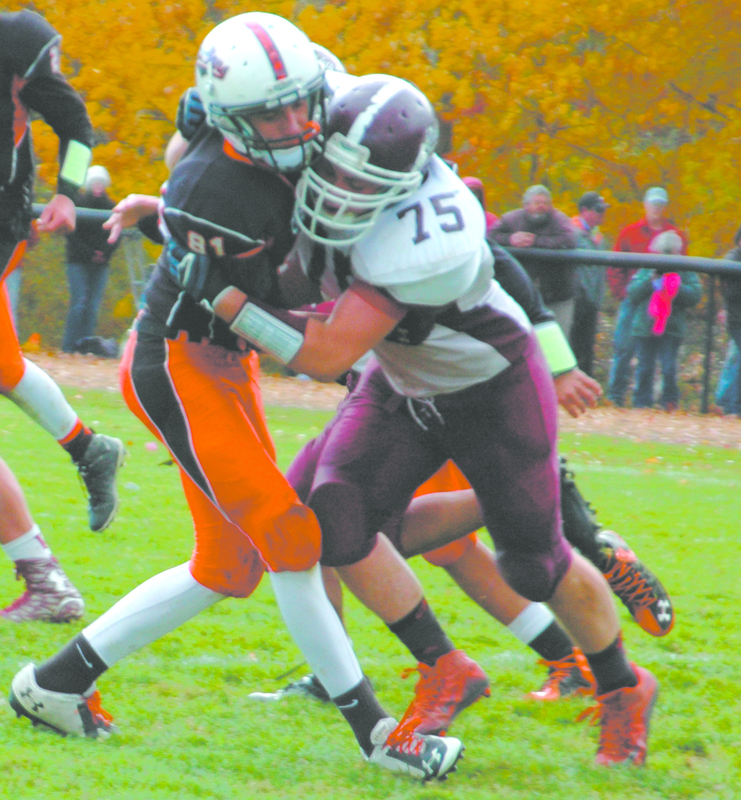 Whitehall defeated Warrensburg 27-6, during homecoming weekend. On the other side of the Section II Class D bracket, second-seeded Cambridge (6-1, 4-1) will battle third-seeded Canajoharie (4-3, 2-3) the same day at 11 a.m. Cambridge narrowly avoided an upset by the Cougars in the regular season, trailing at the half before coming back to win 35-21. Rensselaer (4-3, 2-3) and Salem (1-6, 0-5) missed the playoffs in Section II Class D. Rensselaer was edged out by Warrensburg for the playoffs based on their head-to-head result.